PoE or network clocks permit an organization to use their existing Ethernet to achieve synchronized timing throughout their facilities. PoE clocks offer a number of advantages to the organization. PoE stands for Power over Ethernet. The technology allows you to power devices such as clocks by using just a standard Category 6 Ethernet Patch Cable. Therefore, the clocks will receive not only their time from the Ethernet cable they will also receive their power from the cable. Our wireless clocks do not need an Ethernet cable but do need a power source. This is the advantage of PoE Clocks where the power is provided by the Ethernet. The ability to place an electric analog or digital clock without worrying about installing separate power is a cost savings. The clocks are just endpoints on your network. As end points they are maintenance free. They do not require any human intervention for the adjustment of daylight saving time or to replace batteries. The software that is included with the network clocks can be installed on a networked window based PC. This window-based software will allow you to check the status of all the clocks on your network and to set the time zone for the clocks. The function of setting the time zone is perfect for entities that want or need a world clock configuration to display different time zones. For example, the IT department of a Global company may need a visual display of time where their servers or offices throughout the world in order to accomplish the necessary work they must perform in operating a globally dispersed network. The LED Digital PoE Clocks come in a four inch and two and half inch digit size and available in 4 digits; hour and minutes. They also are available in 6 digits, thereby, showing hour, minute and seconds. Digital clocks offer excellent viewing from a far distance. 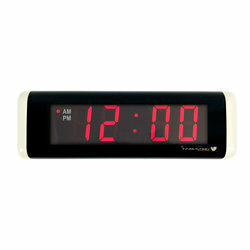 The Digital clocks can also be mounted back to back to provide an excellent hallway clock. The mounting kit for the hallway clocks can be mounted on the wall or ceiling whatever is most appropriate for your facility. The PoE analog clocks we offer come in sizes of 13 and 16 inches. Both sizes can be dual sided and function exceptionally well as hallway clocks. If you have a large hallway dual sided 16-inch clock may be appropriate. Another thought of consideration with our PoE line is that you can easily mix and match analog and digital clocks, whatever, is most appropriate for your facility. We also have a full line of PoE message boards that can not only display urgent and operational messages but also time. These message boards allow for multi functional uses and can be a major communication device for an organization. If you are considering PoE Led Digital clocks and also need a speaker sound system you can also use your Ethernet network to place speakers throughout your facilities. We offer both a Wifi and a IP speaker system. The IP speaker system is a PoE system, therefore, it will get its power from the network. Network based system have an advantage over traditional systems because software replaces all the headend equipment. The elimination of headend equipment reduces cost to maintenance the equipment and makes repairs to the system simple and straight forwarded. Please contact us if additional information is needed.